Seriously, Orriel Smith — yes, that one who was so earnest on Hootenanny in 1964 (it must’ve sucked to be alive in the early sixties, living in low-resolution black and white) and the two spaced-out tracks on Fuzzy Felt Folk — is definitely the best chicken-impersonating coloratura I’ve heard. She even gives the Cackle Sisters a run for their money. 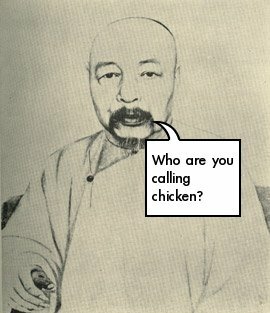 It’s a little known fact that General Tso’s Chicken does not celebrate Zuo Zongtang‘s liking for eating chicken. Instead, it commemorates his pet chicken (whom he named Maude) who travelled everywhere with him in a silk-lined portable coop of fine rosewood. Like the new icon? 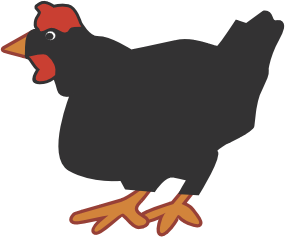 I thought the Atari ST character set image of J.R. “Bob” Dobbs was getting a bit tired, so I found a suitable chicken-related image on openclipart.org. Seems to work in my browser, don’t care about yours. I should really have used the Nong Shim Worried Chicken, but there’s too much editing, copyright and glutamate-consumption—condoning there. Instructions on how to make a website icon for Unix users are from Matthias Benkmann, “How To Create And Install A favicon.ico“. As a memento of actually seeing a chicken in Wingham, I decided to own the domains wesawachicken.com and wesawachicken.info. They both point here. Author scrussPosted on 02004-10-11 02004-10-15 Categories goatee-stroking musing, or somethingTags chicken1 Comment on No, we really did! — sign in a Tyson chicken processing factory, Springdale, Arkansas. I got pointed at ihaveanidea.org by Caroline, who recommend it for a friend who’s looking for an advertising internship. They have TV ad showcases on the site, and I found this New, by hotdogboy. It’s odd. Wilson: We simply asked them: what did you see in the film? Question: No one gave you a response other than “We saw the chicken”? — from “Film Literacy in Africa”, by John Wilson (Canadian Communications vol.1 no. 4, summer, 1961, pp. 7-14), cited in McLuhan’s “The Gutenberg Galaxy”.